Interactive has launched yet another tracking product that satisfies a requirement that customers of ours have been asking about for a number of years. Is there a battery powered Tracking unit that will last longer than 3 years? Is there a tracking product that can be mounted to the outside of equipment but will be robust enough to survive both weather and knocks and scrapes in day to day use? Is there a tracker that can utilise GPS but be in a protective housing as well as RF should GPS not be available? Is there a tracker that is not limited to one Telecom provider but can utilise whichever signal is available in the area? Is there a tracker that has a 24/7 monitoring system if required? HOW DOES TOUGH TRACK WORK? 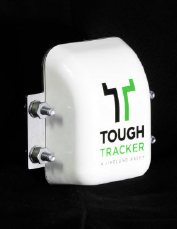 Tough Track is the first and only tracking device to be housed in steal kevlar. It comes in a patented armoured case specifically designed to live up to hostile environments. Unlike all other trackers in the market, the Tough Track is able to withstand impact, is fully weather proof and tamper resistant. Tough Track comes with its own unique power supply. Most other trackers have to be hardwired into an external battery or have a very short battery life. Tough Track's average battery life is 10 years* and it can be used on assets without their own power supply - like trailers, skips and containers. As a innovative and fast moving company we are always on board with the latest technologies. We are proud in the fact that we use our own designs and utilise only the highest quality components. There is no awkward programming or setting up involved. Simply weld or bolt on the Tough Track and you are ready to go. The software is a web based system providing you real time data on a Google maps interface. As long as you have an internet connection you can login and view your assets at any time. Weight: 3.2 Kg including back plate. Armoured composite polymer case with integral steel shielded battery compartment. Welded stainless steel back plate for mounting on assets. Quad band GSM transmitter with cell location function. Ultra high capacity Lithium Metal battery technology. Extra low power consumption with deep sleep circuit technology. All active components are of high quality European manufacture.